Dating back to 2002, The World Poker Tour‘s Five Diamond World Poker Classic in Las Vegas is arguably the most prestigious event on the WPT calendar. This year, New Jersey online poker players can qualify for the event through PlayMGMPoker.com. This marks the first time NJ players can qualify for an out-of-state WPT event. The WPT Five Diamond is set to take from December 5-10 and take place at MGM property, the Bellagio Resort and Casino. 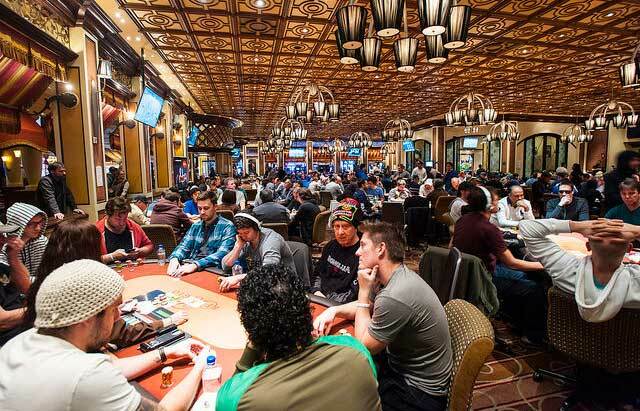 Even though it’s in Nevada, New Jersey players can win a $12,000 package that includes a $10,400 seat in the Main Event as well as $1,600 in cash, deposited directly into the playMGMpoker account, to help with travel expenses to Las Vegas. As an added bonus, all online qualifiers will have their first night’s stay at the Bellagio included for free. Prior to this partnership, online satellites of this nature have been primarily used to qualify players into WPT events taking place at The Borgata. “The ability to qualify New Jersey online gaming players into desirable land-based Borgata poker events has been an extremely valuable resource in helping our poker network grow and succeed within the market.”said Ray Stefanelli, Executive Director of Online Gaming for playMGMpoker. There are a number of ways for players to qualify and step into the $535 Super Satellite to WPT Five Diamonds to play for the $10,400 seat and it starts for as little as $10. Every day at 5:40pm and 8:40pm ET, players can jump into a $10 qualifier where approximately one out of every six players will win a $55 ticket to the Bellagio Qualifier for the Super Satellite. Each of these contests guarantees at least two $55 entries. Also running daily, at 7:20pm ET, the $55 Bellagio Qualifier runs. One out of every 11 entries wins their $535 ticket to the Super Satellite with one seat being guaranteed. The same tournament runs in a turbo format on Sundays at 5:20pm. The $535 Super Satellite to WPT Bellagio Five Diamond takes place on the following Sunday eveningsat 6:20pm ET: November 12, 19, 26 and the final chance on December 3. At least one $12,000 prize package is guaranteed in each tournament. In total, including the previously run Super Satellite, at least five New Jersey online grinders will find their way into one of the biggest live events of the year. Not only is the WPT Five Diamond one of the largest events, routinely awarding seven-figure first-place prize money throughout its rich history, but it’s also the tournament where many top-ranked professionals made a name for themselves. The inaugural WPT Five Diamond, in 2002, saw ‘The Great Dane’, Gus Hansen, win his very first, of three, WPT title. Two years later Daniel Negreanu would go on to win the event for what would hold as a career-best victory for the better part of a decade. In 2006, World Series of Poker Champion Joe Hachem cemented his legacy as more than a one-hit wonder by taking down the Five Diamond for over $2.2 million. The list goes on: Eugene Katchalov, Chino Rheem, Daniel Alaei, Dan Smith, Mohsin Charania and Antonio Esfandiari all have their names etched in the WPT Trophy as victors of the World Poker Tour Five Diamond.